Airports are a business, airports have competition, and therefore, airports need to continually develop themselves and to push their boundaries. Most importantly, airports are about the passenger experience. They are the first point of contact at a destination or a welcome home for the resident. Twenty years ago, airports were far more community orientated - a destination in their own right. As airports evolved and more people began to travel, airports became a processor, a functional space with a few add-ons. They were not focused on being a great passenger experience. They were focused on being a sterile place, a place that people wanted to be in and out of as soon as possible. Today airports are becoming larger, more complex mini cities, but they are again starting to be destination spaces. Airports engage their customers even before they arrive to ensure each and every person has the opportunity of the best passenger experience. We are currently working on the refurbishment and expansion of an airport in Saudi Arabia. The iconic airport opened in the 70’s and back then was a real destination for locals and for those fortunate enough to travel to and from there. Families would drive to the airport to take tea or coffee and marvel at the oasis in the desert and the gateway to their city. As the airport grew and security was increased, rightly so, the airport ceased to become a social hub and part of the community; it became a more sterile place that was less inviting. As part of this refurbishment and expansion programme, part of our brief is to get some of the social aspects back into the place, get the buzz back into the airport, get people and families together, focus on meeters and greeters make it a better place for all. This has the added benefit for the operators, increasing the revenue generation as the offering increases and for the owners as their airports become ‘the place to fly from’. The focus of airport design has, of course, always been on the traveller, but it’s the way in which a traveller is perceived and has been treated that has and continued to change. Previously air travel was for the few, this evolved into travel for the masses. However, along with this came other complications, the obvious one being security. This changed the landscape of air travel and airports. Spaces used to be dictated by the function that housed them, with continued advances in technology and security measures the design can, and has, adapted to put the focus on the experience of the traveller. Airports are also emotional places, making a first great impact puts the passenger at ease and creates a better head space to enjoy the rest of their experience. Making an airport complicated to navigate will stress passengers already going through a stressful experience –not a good mix. As simple as it sounds, it’s about the planning ­– keep it simple, keep it user-friendly, keep it about the traveller. 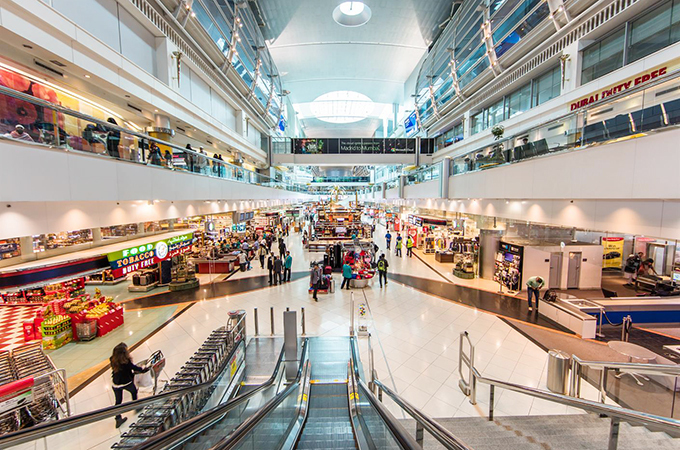 For instance, Dubai International Airport has limited real estate space left in its current location and is being very smart in maximising its use of real estate to ease operations and to ensure the passenger is engaged with the airport even before arrival. It’s a large space and they cleverly plan customer experiences along the internal airport journey to keep the traveller interested and engaged. There are several types of traveller – the psychology is fascinating. You have the business and frequent traveller that just wants to go through the airport without the fuss and if they do want to buy they know where to get it. There is the relaxed passenger, they want to spend a lot of time at the airport, maximise their experience and use as many facilities as they can. They want to shop, they want to be entertained and they want to Instagram – these are potentially high spenders who will treat themselves. We need to help them get their journey off to a great start. There are the easy-going types, they don’t plan in advance they will just go with the flow, if they like what they see they will use it. We need to make sure they see it and use it. There are the first time and irregular travellers. While they may be the minority, we need to make sure they are well catered for and provide facilities that are easy to find and, more importantly, easy for them to find themselves out of and to their gate. They are all different traveller types but have similarities and its comes back around to airports being flexible in their offering and working with the operators to study the economics. Our goal is to create seamless boundaries where F&B meets retail, give the users the option of a quick coffee and croissant and give them the chance to experience fine cuisines, be smart with the real estate and let it work for the owners and operator. You have a captive audience in your hands, make them feel calm, make them feel wanted and remember how much revenue and profit can be made with these facilities. Airports do need to look at new types of spaces and not just rely on retail and the norm, they need to keep up with trends and once more be flexible. Airports need to know their audience – in this region, there is a large focus on transferring and transiting passengers. This is an opportunity not only for airports to show they are best in class, but with the right offering a great return on investment for them. There are so many different types of passengers that use airports, so creating seamless boundaries is important. If something is hard to find, people won’t use it. Not only personal service spaces are important but different types of spaces, galleries, parks green spaces and exercise facilities are becoming more common place in airports. It comes down to knowing your market and consumer.